Undulating bright ridges and dusty clouds cross this close-up of the nearby star forming region M8, also known as the Lagoon Nebula. 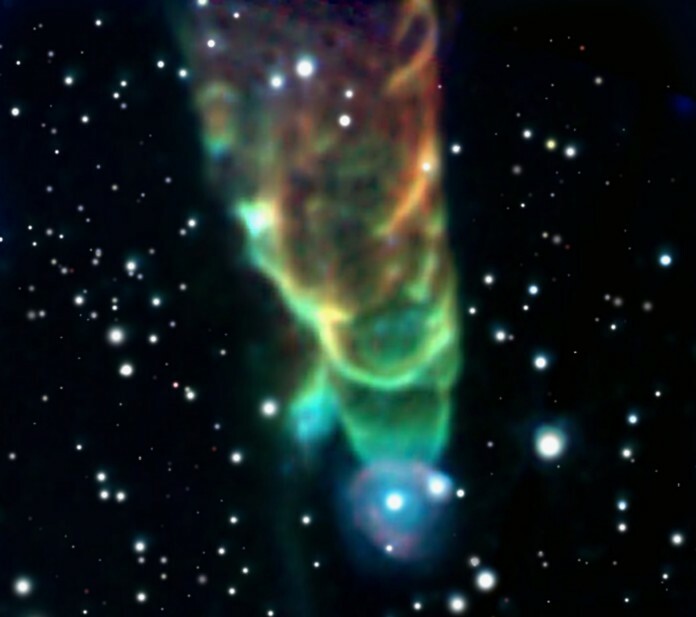 A sharp, false-color composite of narrow band visible and broad band near-infrared data from the 8-meter Gemini South Telescope, the entire view spans about 20 light-years through a region of the nebula sometimes called the Southern Cliff. The highly detailed image explores the association of many newborn stars imbedded in the tips of the bright-rimmed clouds and Herbig-Haro objects. Abundant in star-forming regions, Herbig-Haro objects are produced as powerful jets emitted by young stars in the process of formation heat the surrounding clouds of gas and dust. The cosmic Lagoon is found some 5,000 light-years away toward constellation Sagittarius and the center of our Milky Way Galaxy. South of the large star-forming region known as the Orion Nebula, lies bright blue reflection nebula NGC 1999. Also at the edge of the Orion molecular cloud complex some 1,500 light-years distant, NGC 1999's illumination is provided by the embedded variable star V380 Orionis. The nebula is marked with a dark sideways T-shape near center in this broad cosmic vista that spans over 10 light-years. 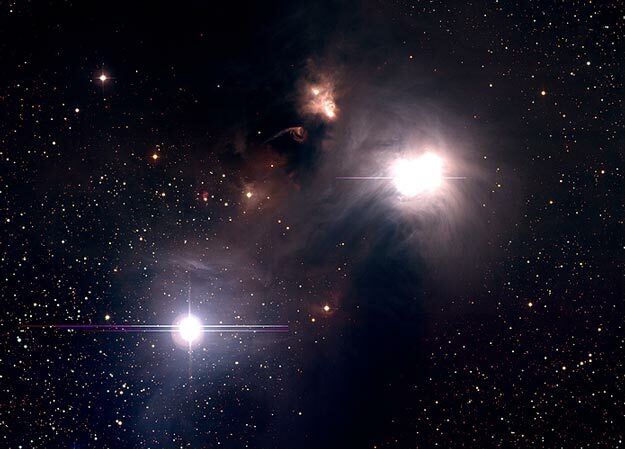 The dark shape was once assumed to be an obscuring dust cloud seen in silhouette against the bright reflection nebula. 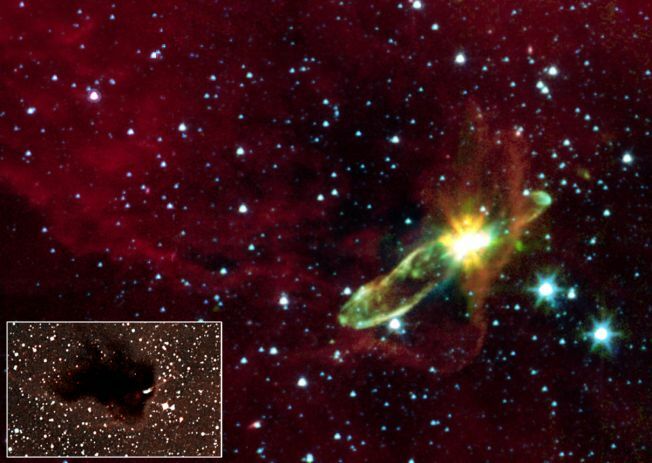 But recent infrared images indicate the shape is likely a hole blown through the nebula itself by energetic young stars. In fact, this region abounds with energetic young stars producing jets and outflows that create luminous shock waves. Cataloged as Herbig-Haro (HH) objects, named for astronomers George Herbig and Guillermo Haro, the shocks appear bright red in this view that includes HH1 and HH2 just below NGC 1999. The stellar jets and outflows push through the surrounding material at speeds of hundreds of kilometers per second. 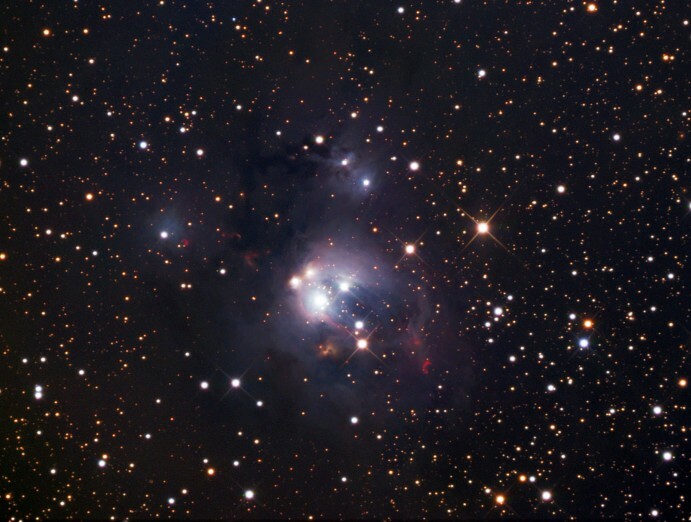 Young suns still lie within dusty NGC 7129, some 3,000 light-years away toward the royal constellation Cepheus. While these stars are at a relatively tender age, only a few million years old, it is likely that our own Sun formed in a similar stellar nursery some five billion years ago. Most noticeable in the sharp, (zoomable) image are the lovely bluish dust clouds that reflect the youthful starlight, but the smaller, deep red crescent shapes are also markers of energetic, young stellar objects. Known as Herbig-Haro objects, their shape and color is characteristic of glowing hydrogen gas shocked by jets streaming away from newborn stars. Ultimately the natal gas and dust in the region will be dispersed, the stars drifting apart as the loose cluster orbits the center of the Galaxy. At the estimated distance of NGC 7129, this telescopic view spans about 40 light-years. The prominent ridge of emission featured in this vivid skyscape is designated IC 5067. Part of a larger emission nebula with a distinctive shape, popularly called The Pelican Nebula, the ridge spans about 10 light-years and follows the curve of the cosmic pelican's head and neck. Fantastic, dark shapes inhabiting the view are clouds of cool gas and dust sculpted by energetic radiation from hot, massive stars. But stars are also forming within the dark shapes. In fact, twin jets emerging from the tip of the central, dark tendril are the telltale signs of an embedded protostar cataloged as Herbig-Haro 555. The Pelican Nebula itself, also known as IC 5070, is about 2,000 light-years away. To find it, look northeast of bright star Deneb in the high flying constellation Cygnus. 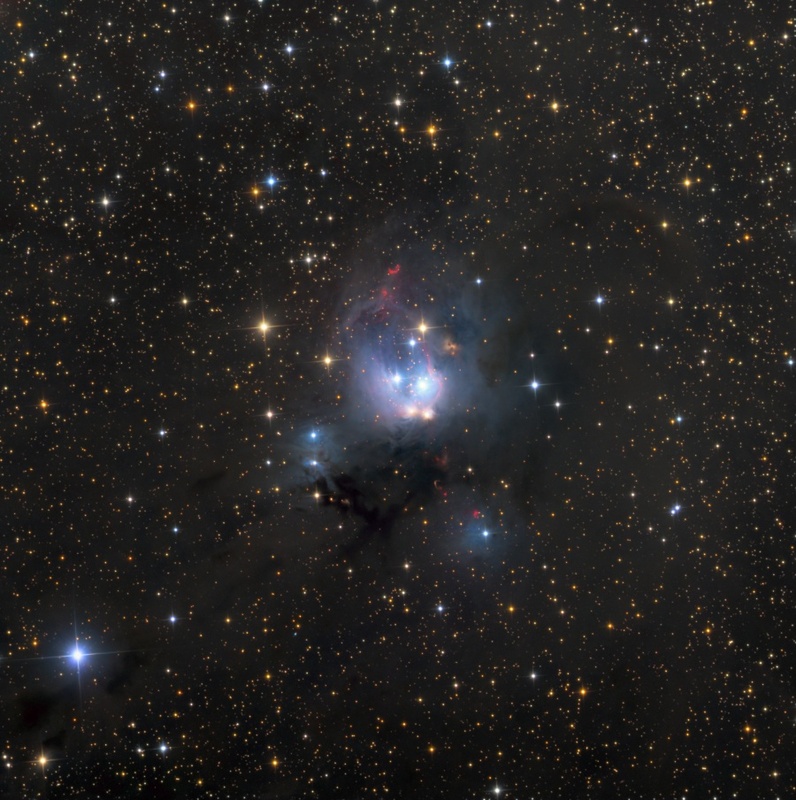 Young suns still lie within dusty NGC 7129, some 3,000 light-years away toward the royal constellation Cepheus. While these stars are at a relatively tender age, only about a million years old, it is likely that our own Sun formed in a similar stellar nursery some five billion years ago. Most noticeable in the striking image are the lovely bluish dust clouds that reflect the youthful starlight, but the smaller, deep red crescent shapes are also markers of energetic, young stellar objects. Known as Herbig-Haro objects, their shape and color is characteristic of glowing hydrogen gas shocked by jets streaming away from newborn stars. Ultimately the natal gas and dust in the region will be dispersed, the stars drifting apart as the loose cluster orbits the center of the Galaxy. 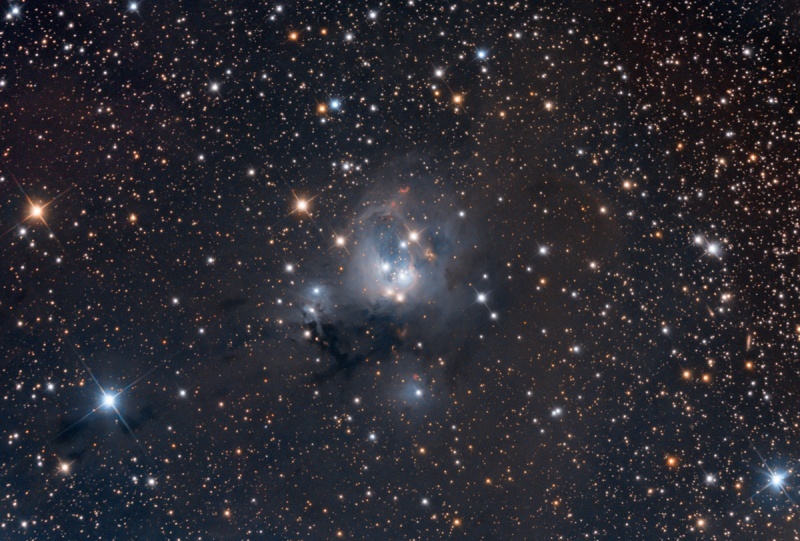 At the estimated distance of NGC 7129, this telescopic view spans about 40 light-years. This tantalizing array of nebulae and stars can be found about 2 degrees south of the famous star-forming Orion Nebula. The region abounds with energetic young stars producing jets and outflows that push through the surrounding material at speeds of hundreds of kilometers per second. 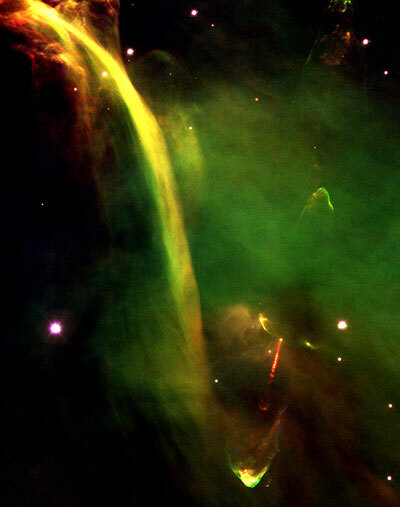 The interaction creates luminous shock waves known as Herbig-Haro (HH) objects. For example, the graceful, flowing arc just right of center is cataloged as HH 222, also called the Waterfall Nebula. Seen below the Waterfall, HH 401 has a distinctive cone shape. 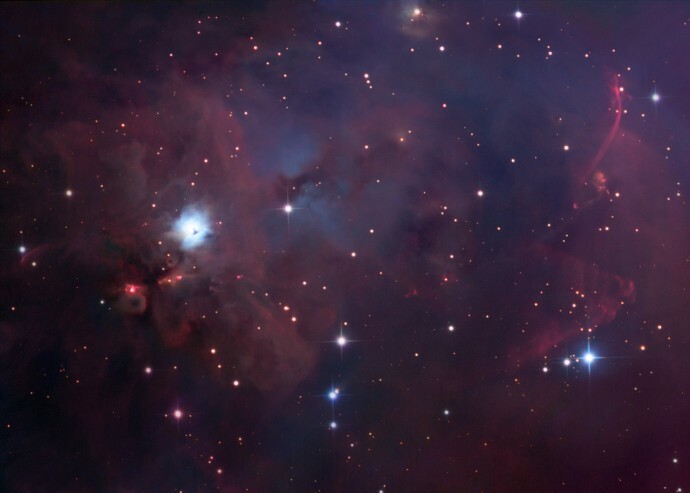 The bright bluish nebula below and left of center is NGC 1999, a dusty cloud reflecting light from an embedded variable star. The entire cosmic vista spans over 30 light-years, near the edge of the Orion molecular cloud complex some 1,500 light-years distant. Inside the head of this interstellar monster is a star that is slowly destroying it. The monster, actually an inanimate pillar of gas and dust, measures over a light year in length. 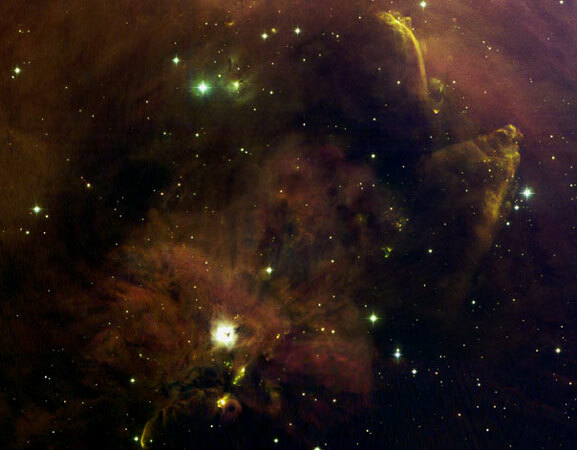 The star, not itself visible through the opaque dust, is bursting out partly by ejecting energetic beams of particles. Similar epic battles are being waged all over the star-forming Carina Nebula. The stars will win in the end, destroying their pillars of creation over the next 100,000 years, and resulting in a new open cluster of stars. 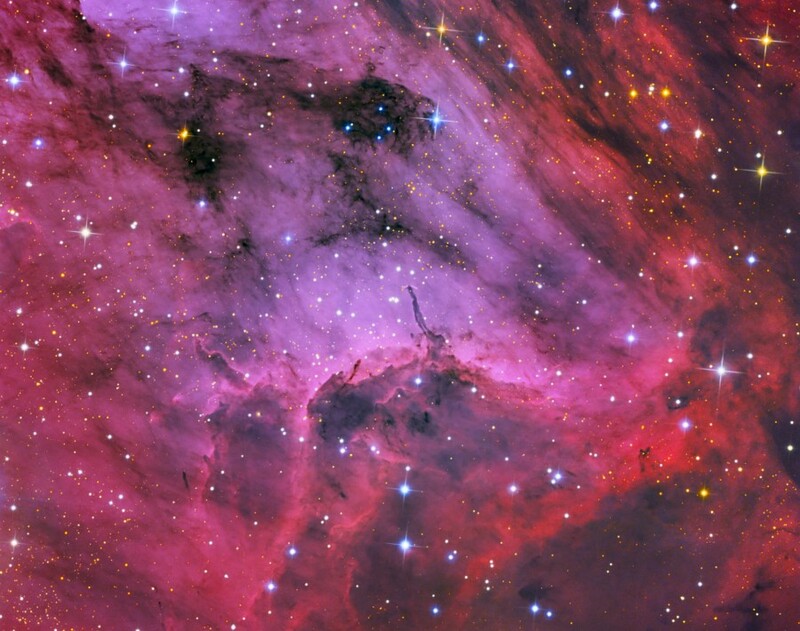 The pink dots are newly formed stars that have already been freed from their birth monster. 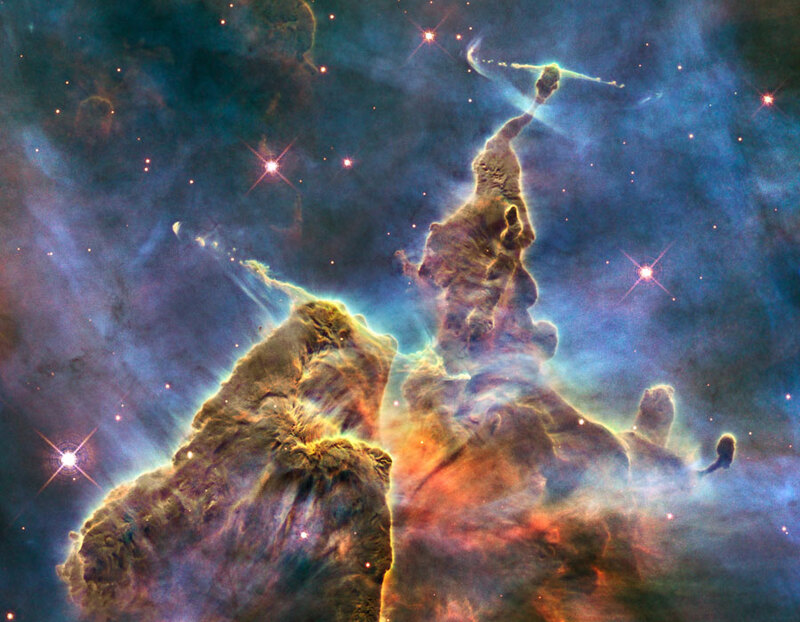 The above image is only a small part of a highly detailed panoramic mosaic of the Carina Nebula taken by the Hubble Space Telescope and released last week. The technical name for the stellar jets are Herbig-Haro objects. How a star creates Herbig-Haro jets is an ongoing topic of research, but it likely involves an accretion disk swirling around a central star. A second impressive Herbig-Haro jet is visible across the bottom of a larger image. South of the large star-forming region known as the Orion Nebula, lies bright blue reflection nebula NGC 1999. The nebula is marked with a dark inverted T-shape at the lower left in a broad cosmic vista that spans over 10 light-years. 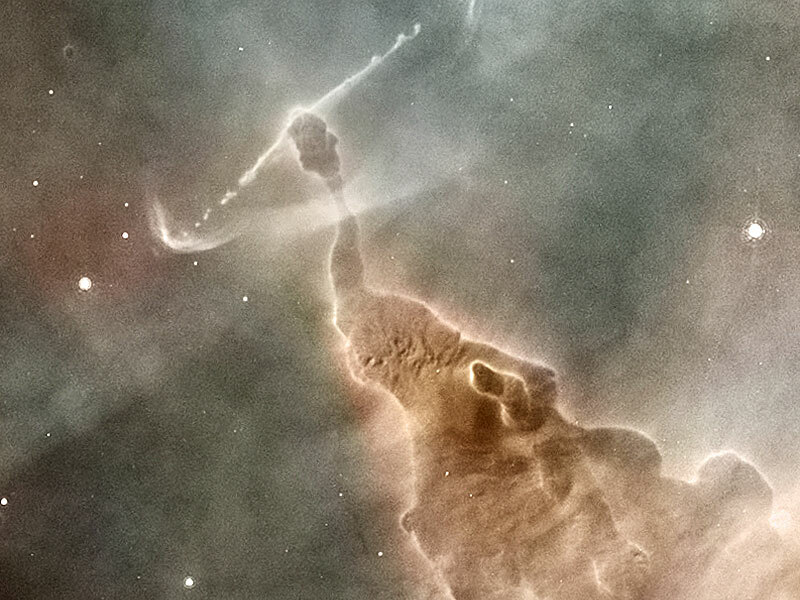 The dark shape is a dense gas and dust cloud, or Bok globule, seen in silhouette against the bright nebula, and likely a site of future star formation. 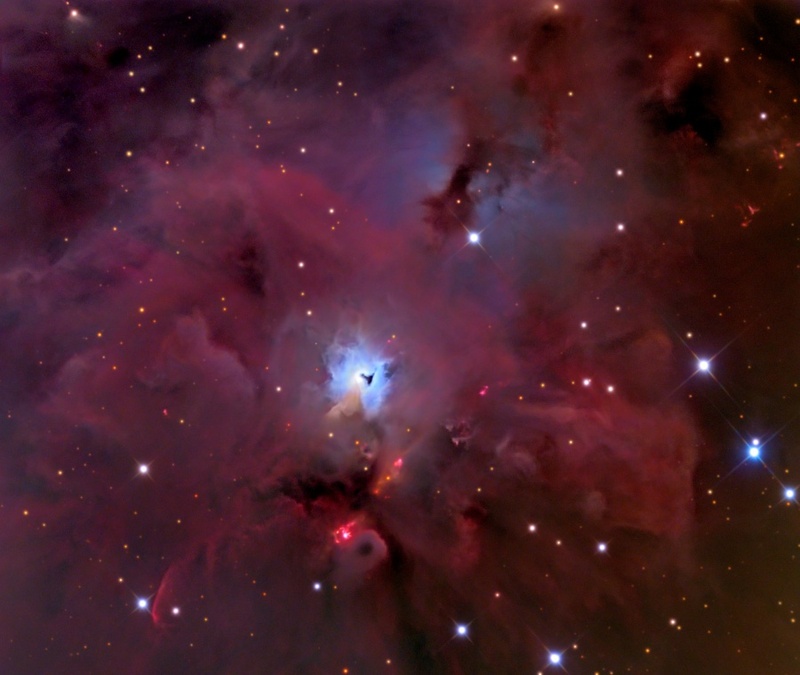 At the edge of the Orion molecular cloud complex some 1,500 light-years distant, NGC 1999's illumination is provided by the embedded variable star V380 Orionis. The region abounds with energetic young stars producing jets and outflows that create luminous shock waves, including HH (Herbig-Haro) 1 and 2 just below and left of NGC 1999, and the apparent cascade of reddish arcs and bow shocks beginning at the upper right. The stellar jets and outflows push through the surrounding material at speeds of hundreds of kilometers per second. High-speed outflows of molecular gas from a young stellar object glow in infrared light, revealing themselves in this recent false-color image from the Spitzer Space Telescope. Cataloged as HH (Herbig-Haro) 46/47 the infrared source is lodged within a dark nebula or Bok globule - near the lower right corner of the dark nebula in the optical inset - that is largely opaque when viewed in visible light. The energetic outflow features extend for nearly a light-year, burrowing into the dark interstellar material, and are attributed to early stages in the life of a sun-like star. They may well represent a phase of our own Sun's evolution which took place some 4.5 billion years ago, along with the formation of our solar system from a circumstellar disk. A tantalizing object to explore with Spitzer's infrared capabilities, this young star system is relatively nearby, located only some 1,140 light-years distant in the nautical constellation Vela. Young star R Coronae Australis has a dusty home. The dust is so thick on the upper left of the above photograph that little light from background stars comes through. Thinner dust near the stars reflects light from R Coronae Australis (upper right) and neighbor TY Coronae Australis, giving their surroundings a flowing appearance. Were these stars more massive they would emit light energetic enough to ionize much of the nearly invisible surrounding hydrogen gas, causing it to appear bright red. The unusual structure above the center is a Herbig-Haro object, a knot of gas ejected from the star that has impacted surrounding gas. R Coronae Australis is about 500 light-years away, while the region shown is about four light years across. New stars, fast jets, and shocked gas clouds all occupy Orion A, a giant molecular cloud just south of the Orion Nebula. The bright object visible below and slightly left of center of this recently released picture is the reflection nebula NGC 1999. Wind from NGC 1999's central star, V380 Orionis, appears to have created the surrounding billows of red and brown gas. 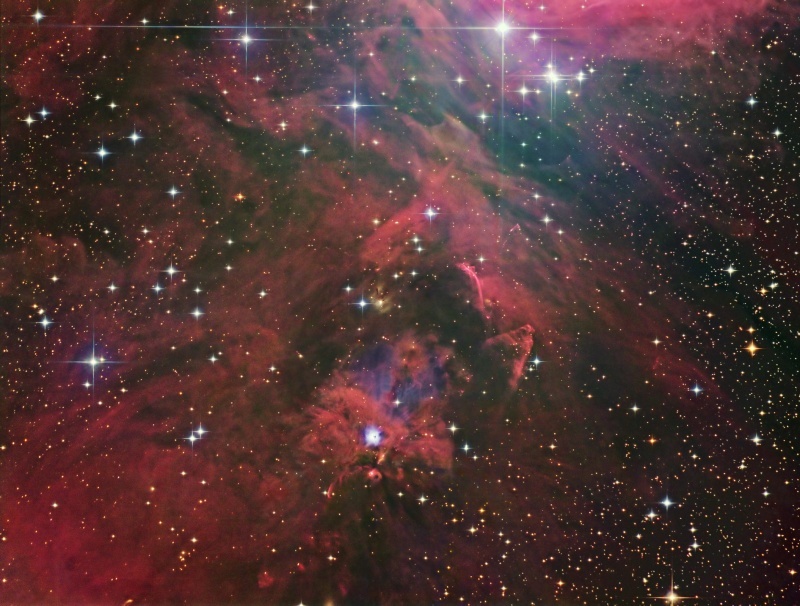 Several bright young stars illuminate reflecting dust at the top right of the image. Jets shoot from dozens of young stars creating glowing compressed shocked waves known Herbig-Haro objects. One such shock is the unusual Waterfall, the bright streak on the upper right, which is a source of unusual radio waves. The cone-shaped shock to the Waterfall's lower right may result from a jet emitted HH1 and HH2, located 10 light-years away below NGC 1999. The unusual and energetic oddities that occur and interact in star forming regions are often as complex as they are beautiful. Some features of HH-34 are understood -- some are not. At the core of Herbig-Haro 34 lies a seemingly typical young star. This star, though, somehow ejects energetic "bullets" of high-energy particles, appearing as red streaks toward the lower right of the this image. Astronomers speculate that a burst of these particles might rebound when gas from a disk surrounding the star momentarily collapses onto the star. Visible near the end of each light-year long jet is a glowing cap. HH-34 lies about 1500 light-years away in the Orion Nebula star-forming region. The cause of the large arc of gas on the upper left known as the waterfall remains unexplained. Planets condense from disks. Several new Hubble Space Telescope pictures of stars surrounded by disks were released earlier this week. Since the glare of the central star usually makes a surrounding disk hard to see, prior observations in radio and infrared light were used to isolate systems where the disk was edge-on, blocking much of the central starlight. One such disk system, Haro 6-5B, is shown above in false color. Here, the central disk confines the emitted light into an hourglass shape. Complex dust clouds appear dark. 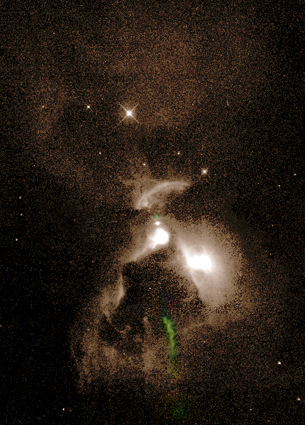 A powerful protruding jet is shown in green. This budding planetary system measures 0.2 light-years across. Quite possibly, our own Solar System looked like this about 5 billion years ago. A cloud of interstellar gas and dust collapses and a star is born. At its core temperatures rise, a nuclear furnace ignites, and a rotating dusty disk forms surrounding the newborn star. According to current understanding, as material continues to fall onto the disk it is heated and blasted back out along the disk's axis of rotation, forming a pair of high speed jets. This Hubble Space Telescope image shows two nebulosities at the ends of opposing jets from a young star. The bright blobs at either end are where the jet material has slammed into interstellar gas. Tip to tip, the distance is about one light-year. Located near the Orion Nebula, these nebulosities have catalog designations HH1 and HH2 for their discoverers astronomers George Herbig and Guillermo Haro. The nascent star which produced the jets is in the middle, hidden by a cloud of obscuring dust. Yet the structures and details visible in the star jets offer clues to events which also occured in our own Solar System - when the Sun was formed from a collapsing interstellar cloud 4.5 billion years ago. The star masked by a dust cloud at the left of the above photo is expelling an energetic beam of charged particles into interstellar space. This jet, moving from left to right, has burrowed through much interstellar material, and now expands out into the interstellar space. Although jet particles move at nearly three hundred kilometers per second , we still do not see any daily movement because of the enormous distances involved. In fact, the jet is trillions of kilometers long. This stellar jet occurs in a system called HH-47 which is located near the edge of the Gum Nebula.